The process behind the J5’s two previous singles was too successful and irresistible not to try again. And for the third time, the resulting song stuck at the top of the chart. The product of a Berry Gordy and the Corporation, “The Love You Save” bears more than a passing resemblance to “ABC” and “I Want You Back.” Don’t fall into the trap of writing off the song as a carbon copy, though. “The Love You Save” has a more complex arrangement – it deviates from AABA structure – and greatly benefits from Jermaine’s supporting vocals. Plus it’s just as infectious and fun as the first two singles. On their tours in the late ‘70s and early ‘80s, the Jacksons combined all three songs in one medley. It was an obvious and surefire idea. Put these three together and you’ve got 10 minutes of music guaranteed to put a smile on the most hardened face and get the most sedentary feet moving. The lyrics in “The Love You Save” echo the warning Diana Ross delivered five years earlier on “Stop! In the Name of Love,” another Motown No. 1. Both songs open hard on the word “stop” and implore their partners to both slow and settle down. Playing these songs back to back shows how far Motown has pushed soul music. The excitement of the Holland-Dozier-Holland composition is tempered by Ross’ mannered delivery that almost turns her pleading into nagging. On the other hand, the Corporation’s number jumps out of the speakers with a kinetic energy and Michael’s charismatic vocals. The supporting string arrangement is only hint of the assembly line Motown sound that HDH developed. 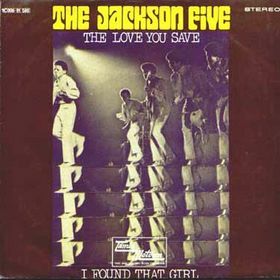 Few artists have covered “The Love You Save.” More noteworthy are the songs penned by Joe Tex and the Holmes Brothers that bear the same name.